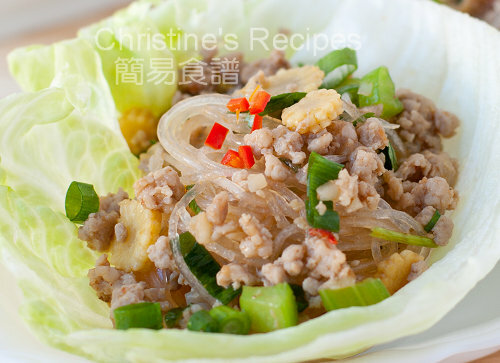 Cellophane noodles are also known as Chinese vermicelli, bean threads, bean thread noodles and glass noodles. I wonder why it has so many different names. Amongst these names, I like the name of “cellophane noodles” the most because it represents their translucent appearance after being cooked, with a very appealing effect to my eyes when mixed with other salads or meats. Noodles are often on our family’s menu, whether they are cooked in soup or stir-fried with beef, chicken or pork. For this month’s international incident is to cook noodles, I’d like to create a deviant one for this special occasion. an unusual dish with some usual ingredients. I made noodles in crisp lettuce cups, alike San Choi Bao that I posted before, yet adding lots of spices into it. 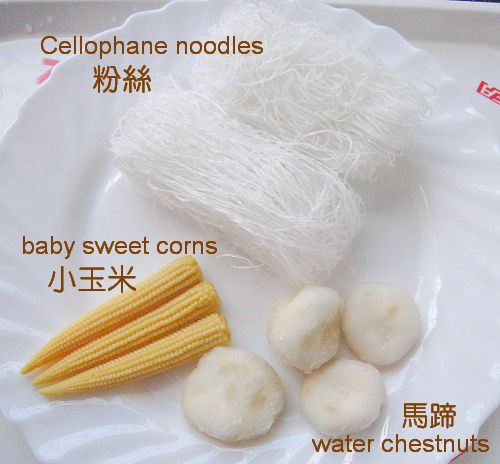 Also by tossing in some water chestnuts, celery and baby sweet corns, the smooth cellophane noodles were mixed into a bed of crunchy vegetables. As I expected, this dish was refreshing, full of spices with many flavours. Mix ground pork with marinade well for 15 minutes. Soak cellophane noodles in boiling water for 10 minutes. Drain well and set aside. In a frying pan or wok, heat vegetable oil over medium-high heat. Saute ginger, garlic and ground bean sauce until aromatic. Add pork and cook for 5 minutes. Stir and separate the pork into smaller pieces if they stick together. Remove from heat. Stir in noodles, spring onion and coriander. Season with lime juice, fish sauce and sesame oil. Mix well. To serve, arrange lettuce leaves on plates. 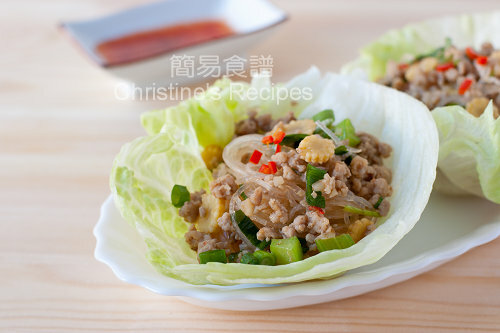 Spoon pork and noodles mixture on lettuce cups. Garnish with chopped chilies if desired. Drizzle with chili sauce. Such a nice and healthy dish isn't this? The addition of chestnuts gives it a nice crunch. Thanks for joining the party! Delicate and beautiful! Simply gorgeous and I bet they tasted wonderful too! How neat that you served the noodles in the lettuce cups, love the presentation and looks super delicious! What an absolutely yummy sounding meal, I love using lettuce as a means of conveying the food to my mouth, Makes me feel like a kid. Yum! I love ordering these when out, but you've showed me they really are so simple and would be a great family recipe... especially as we all love tacos, and they are somewhat similar! Thank you! I should try to make this sometime....very delectable and fits my taste! I love the crunch that the lettuce cups add to this dish! These look so light and healthy as well as fun to eat! Lettuce cups are so healthy. Yum! These lettuce cups looks so good. I love the ingredients and flavors in the filling. I always think food should be fun and this dish certainly looks like fun - both to make and eat. Yum! Loved the presentation Christine. 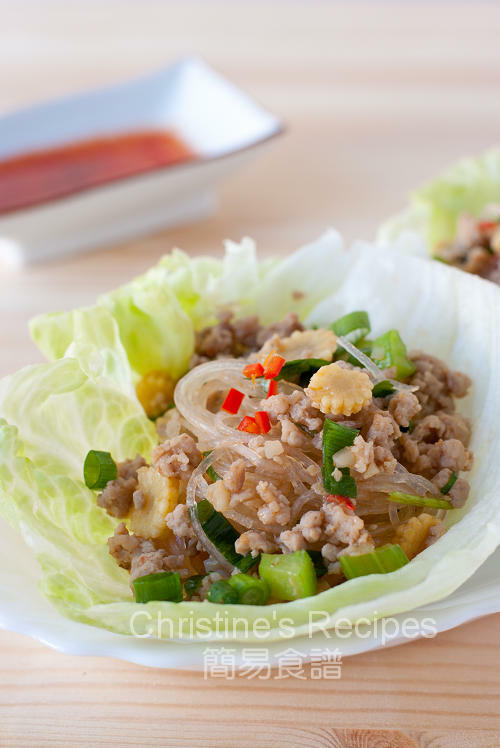 I've never seen glass noodles, but I do fancy them, the lettuce cups is a cool idea! This looks fantastic and fresh and healthy! So pretty, too. I bet it would work with ground chicken... which I happen to have in my fridge. Yum! Very nice presentation. Great idea adding it wraps! Very nice presentation! Great idea adding it to the wraps! That is a wonderful adaptation Christine! Well done! This is one of my fave dishes -- layers of flavors and textures all bundled up into a cold, crisp lettuce package. Thanks for the reminder that it's been way too long since I last made this.